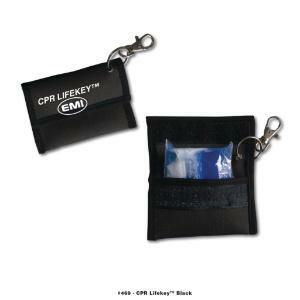 The EMI CPR Lifekey™ lets you carry your CPR Lifeshield™ with your keys or on your belt. The lightweight, clear and flexible CPR Lifeshield™ has positive one-way breathing tube. The CPR Lifekey™ comes in a convenient nylon case with a swivel eye-snap hook, which attaches easily to your key chain or belt loop. The case is available in black.